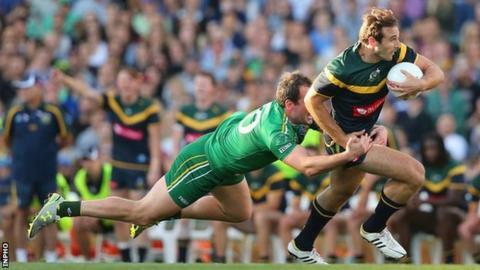 Australia survived a spirited comeback from a battling Ireland team to win the International Rules Test 56-46 in Perth and secure the Cormac McAnallen Trophy. The hosts raced into a 22-4 lead by the end of the first quarter and extended their advantage to 35-7 by half-time. A Darren Hughes goal helped the Irish reduce their deficit to 46-30 after the third quarter and a Colm Begley over left the visitors 13 points adrift. A late Nick Smith own goal gave Ireland hope but the Aussies held on to win. The build-up to this year's only encounter between the sides was dominated by speculation about the future of the fixture but the sides responded by serving up an entertaining spectacle at Paterson's Stadium. The enthusiastic 38,000 crowd also made for a good atmosphere in Perth as Ireland fought back to leave the home side looking over the shoulder in the closing stages before they closed out the contest to win. The series looked to be on life support 12 months ago when Australia's wholly indigenous squad of players were routed in the two Tests in Ireland. Australia picked a much stronger squad this year and their selection paid off early on as they built up an 18-point lead after the first 18 minutes thanks to three overs from Steve Johnson, one apiece from Brent Harvey, Cha Wingard, Jarrad McVeigh and Joel Selwood, plus a Nick Riewardt behind. Ireland's only scores came courtesy of a Colm O'Neill behind and a late over from skipper Michael Murphy. The second quarter yielded a David Moran over and behinds from Pearse Hanley and Tyrone forward Sean Cavanagh for Ireland, but the Australians continued to dominate with some outstanding play. Riewoldt contributed three overs and Steve Johnson grabbed another, with Luke Breust adding a behind. After half-time, Paul Earley's men put the home side under pressure by showed their footballing skills and forcing their opponents into mistakes as they made a heroic comeback. Wingard scored an over, but Monaghan's Hughes proved the inspiration for the revival with a goal, finishing low and accurately past Dustin Fletcher. Fellow Farney County player Conor McManus and Tyrone's Mattie Donnelly helped themselves to two overs apiece as Ireland breathed life into the game by scoring 18 points without reply to move to within 16 at 42-26. Kevin McKernan also got in on the act with an over as Ireland gave themselves a realistic hope of overhauling the Aussies to complete an unlikely recovery in the final quarter. Colm Begley shot a fine over from way out on the line to reduce the gap to 13 with 14 minutes to play, but Wingard slotted an over after nailing a huge mark for his side. Three-pointers from Kieran Jack and Breust put Alastair Clarkson's outfit in control again at 56-37, but Smith smashed the ball into the Australian net for an own goal to offer the Irish some late hope. Murphy had the chance but his effort was weak and Fletcher saved on the line but, in the muddle, Smith found his own goal. McManus finished the game with a sublime score but time ran out for the gutsy Irish as the Australians ran out 10-point victors and levelled the tally of series wins in the history of the competition at nine each. The GAA and AFL are scheduled to hold talks on the future of the series on Sunday but Saturday's entertaining contest may have bought some more time for the hybrid code. Australia: Dustin Fletcher; Nick Smith, Harry Taylor, Sam Mitchell; Jarrad McVeigh, Luke Hodge, Kieran Jack; Jobe Watson, Joel Selwood; Robbie Gray, Steve Johnson, Brent Harvey; Luke Breust, Nic Naitanui, Chad Wingard. Ireland: Paddy O'Rourke; Neil McGee, Finian Hanley, Ciaran McDonald; Chrissy McKaigue, James McCarthy, Lee Keegan; David Moran, Pearse Hanley; Seán Cavanagh, Michael Murphy, Colm Begley; Colm O'Neill, Aidan O'Shea, Colm O'Neill, Conor McManus. Interchange: Colm Boyle, Cathal Cregg, Mattie Donnelly, Darren Hughes, Kevin McKernan, Kevin McLoughlin, Ross Munnelly, Aidan Walsh. Scorers for Ireland: C McManus 12 (0-3-0), D Hughes 7 (1-0-1), Nick Smith 6 (Own Goal), M Donnelly 6 (0-2-0), M Murphy 3 (0-1-0), K McKernan 3 (0-1-0), C Begley 3 (0-1-0), S Cavanagh 2 (0-0-2), C O'Neill 1 (0-0-1), P Hanley 1 (0-0-1), R Munnelly 1 (0-0-1), D Moran 1 (0-0-1). Scorers for Australia: N Riewoldt 13 (0-3-1), S Johnson 12 (0-4-0), C Wingard 9 (0-3-0), J McVeigh 6 (0-2-0), R Gray 5 (0-1-2, Luke Breust 4 (0-1-1), J Selwood 3 (0-1-0), B Harvey 3 (0-1-0), K Jack 3 (0-1-0), B Smith 1 (0-0-1).